I have said to myself before that even if I am not a fan of a director's work, I can still respect his or her filmmaking style. A while after I saw Moonrise Kingdom, I said how I wasn't a fan of the film at first, yet I still applaud Wes Anderson for still having a special creative mind. However, after watching this film and Royal Tenenbaums, I have come to both respect Wes Anderson's filmmaking style while still becoming a fan of his work. The Grand Budapest Hotel follows the story of a hotel concierge named Gustave H. (Ralph Fiennes) that finds himself on the run with his lobby boy named Zero (Tony Revolori) after he is framed for the murder of a rich woman named Madame D. (Tilda Swinton). It is up to those two to try and prove Gustave's innocence as the story progresses from the first to second World War. First off, I absolutely loved the production design. Director Wes Anderson is known for his visual eye and here, his vision really shows as we are taken to different places of different colors. We go from the titular hotel, which is very pink with everyone wearing purple to a light-green and less ravishing prison to even a monastery with everyone donned in white, yet I just found myself wanting to be a part of this journey. I even thought the costume design was very rich. One thing that I even noticed was that, in Madame D's last scene, she is wearing red, which would foreshadow what happens afterward. I also really liked the acting from some of the cast. Ralph Fiennes just stole the show as Gustave H. Fiennes was so good that he made we wish that his character had his own movie. Not only is he played for laughs, but there are even quieter moments where we see a more human side to Gustave as he begins to show a softer side. Tony Revolori also really shines as young Zero and I loved the scenes between him and Fiennes as I thought they had wonderful chemistry. If there were other standouts in the cast, I would say they are Willem Dafoe as the mysterious henchman Jopling and F. Murray Abraham, who is very poignant as the older version of Zero. All the other actors, who are too numerous to name, were quite good, even if plenty of them had smaller roles. Another thing that I really liked was the story. What I thought was neat about the story was how it was a murder mystery, only Wes Anderson-ized with a twisted dark sense of humor. Yet, because this story is set in between the Wars, the titular hotel is used as a metaphor for the Wars and fascism. It is even used as a demonstration for the decline of civilization. In the early past where the adventures of Gustave and Zero take place, the hotel is very colorful and ravishing. But in the more present day, even though the hotel has its fair share of colors, it still now seems very vanilla. 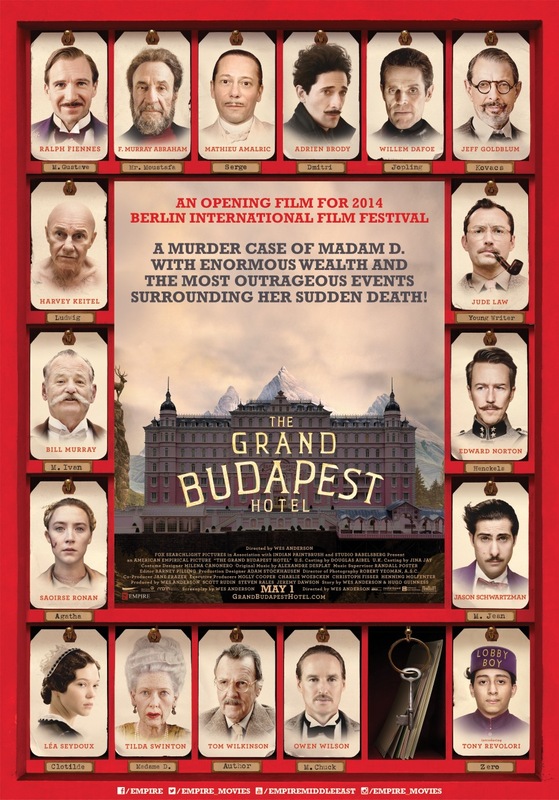 Overall, The Grand Budapest Hotel is an extravagant colorful treat with a complex and rather humanistic storyline. It has outstanding direction, wonderful production/costume design, and a scene-chewing performance from Ralph Fiennes. After watching this and The Royal Tenenbaums, I have finally started to warm up to Wes Anderson and his creative genius. If you are a Wes Anderson fan, I would say absolutely. But if you aren't too familiar with his work, then I would say watch this and keep an open mind or watch The Royal Tenenbaums to become more accustomed to his filmmaking style.